was L'idee de fable by Teresa Chevrolet subtitled Theories de la fiction poetique a la Renaissance (Droz, 2007) a 700 page tome covering many aspects of the symbolic literature of the period. Not only is the material fascinating but it is written in a discursive style which I particularly liked, if only as an example of good writing. Chevrolet uses every grammatical, syntactical and oratorical trick to express difficult concepts clearly and in this blog, I will try and summarize some of the subject matter to give an indication of its wide scope. As Chevrolet says the main purpose of the book is to study the relationship of the fable or allegory to truth but this general theme includes many topics: the relationship of poets and philosophers, mystery and secrecy, the tension between the wish to conceal secret knowledge from the uninitiated and the simultaneous didactic desire to reveal those same secrets, the impact of the discovery of the hieroglyphs, negative theology, silence as a limit for figuration, the distinction between words and things and between the sweet and useful, the evolution of allegory into the exemplum, poetry as a form of logic and its relationship to ethics, the development of fantasy and imagination out of mimesis, the necessity for decorum, the concept of enargeia and verisimilitude, the persistence of Aristotle's goal for poetry of the marvellous, which in turns leads on to the sublime, and finally the development of conceptisme or wit. Along with this dizzying list, mouthwatering for any student of the subject, is an examination of almost all the theoretical treatises of the age on poetics. I confess to having got bogged down in some of the latter and in, for instance, the details of the debate between Castelveltro and Patrizi on the relative merits of Plato's and Aristotle's approaches to mimesis. but this was a small price to pay for a cornucopia of information and discussion. Chevrolet starts with the strictures of Plato on the status of the poet. According to Plato, as we know, the poet was doubly a liar since first he distorted the things of nature and these in turn were only reflections of Plato's absolute Ideas. This was a bad start for poetry and much of the discussion on poetics for the next two thousand years, was how to reconcile this implication of mendacity with creativity and imagination. One solution was to rationalize the use of allegory; it was acceptable, if the literal text was intended to point to a concealed moral injunction. Another was that of Aristotle who indicated that mimesis, the function of poetry, could depict nature as it should be, as a product of the imagination, as well as nature as it actually was. St Augustine further validated the genre in his Contra Mendacium where he distinguished between fiction and lying. The rediscovery, late in the Renaissance, of Aristotle's Poetics reignited the debates about the nature of poetry and gave rise to a proliferation of treatises on the subject. The Poetics gave scope for a more imaginative view of the poet's task, of seeing mimesis as descriptive of action and of allowing fantasy in addition to allegory, as descriptive of things as they should be rather than just as they were. Henceforth art was to 'transfigure' nature. In spite of its length and depth, this book deserves to be read again and again and I hope I can find the time to do just that. This blog is prompted by my reading an excellent little book entitled Les Grotesques by Philippe Morel, Flammarion, 1997 (little is the word - not only the actual size but the font is minute not more than 8 point which makes the read an arduous task). It describes and theorizes about the grotesques with which a great many Italian palaces were decorated in the latter half of the 16th century. There are some 180 photographs illustrating wonderfully imaginative grotesques and their ensembles, together with full notes and a good bibliography. I read it in the hope of learning the connection between the grotesques of medieval manuscripts, Renaissance decoration and Renaissance books, particularly the frames of the pictures in such books which are often made up of grotesques. Then there is a further connection between the grotesques and the books of monsters of which many were published in the 16th century and the satires of the age which were illustrated by grotesques e.g. the Songes Drolatiques de Pantagruel. I was also interested to learn whether the grotesques constituted a language or allegorical sign system which could be fitted into the genres of symbolic literature. Would you not laugh such pictures to behold? The primary meaning of mimesis was clearly copying but copying what: nature and human activity as it was or as they could be imagined? And if the latter, were non-existent forms acceptable? The debate flowed back and forth between the extremes and in the meantime the practice of decorative grotesques continued. It had been orthodox belief at least since Isidore of Seville that there were areas of nature that were undiscovered and it was there that monsters and grotesques might be found. It is not a coincidence that the period of decoration that Morel covers in his book, the late 16th century, is exactly the moment when books of prodigies and monsters were most popular e. g. Boiastuau’s Histoires Prodigeuses of 1561, the Prodigeuses of Lycosthenes of 1557 and Ambroses Paré’s Des monstres et prodiges of 1573. At the same time, there was recognition that important similarities existed between different species, even between animals and plants, that indicated links or connections of some kind between them and it was accepted that animals such as Horace describes in his poem could be created by the union of different species and these hybrids were thus not necessarily non-existent and certainly not unimaginable. But this was more than a sort of primitive darwinism. It reflected the contemporary paradigm of a sympathetic relationship between all created things of which the familiar connection between microcosm and macrocosm was just one example. (see the full discussion by Michel Foucault in Les Mots et Les Choses Paris 1966 rendered in English as The Order of Things) Sympathy counterbalanced by antipathy, what we call attraction and repulsion, was the driving mechanism of the world and of life, a notion first formulated by the earliest Greek philosophers with their dynamic of love and strife, eros and eris. Without the sympathy between created things, the world would revert to the primal chaos. The grotesques, therefore, illustrated a profound belief by contemporaries about the physical nature of the world and existence. Apart from the symbolic meaning of those monsters and hybrids in the bestiaries, and described for instance as late as 1614 in the Cinqs Livres des Hieroglyphes by Pierre Dinet, there was no attempt to create a coherent symbolic language with the grotesques such as the hieroglyphic language was recognized to be (although the hieroglyphic translation by Renaissance scholars was largely fanciful). 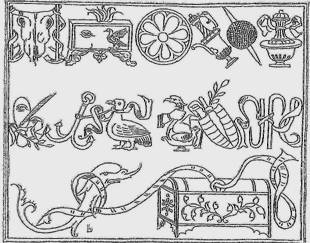 Both grotesques and hieroglyphs were found in decorative schemes alongside other symbolic species such as emblems and devices. As such and in their paradoxical and incoherent forms, they followed the paradigm of the age: the ongoing search for ways to conceal and reveal the mysteries of heaven and earth. I have remarked before on the references to the titles of occasional pieces which Aulus Gellius makes in the introduction to his Attic Nights while he is rationalizing the name of the title of his own work. I have emphasized this topic since these collections of occasional pieces, poikilia (variegated), atakta (jumbled up), summikta (mixed), as they are described, are the forerunners of a myriad such collections expressed in the doxographies, anthologies, florilegia and commonplace books which populated the literary world from classical times through the Renaissance and served as vehicles for the symbolic literature. In this blog, I focus on the origin of those collections whose names had references to weavings, dress or textiles. The Peplos is one such, the Stromata (tapestry, miscellanies or patchwork) the name of the book by Clement of Alexander (late 2nd Century CE), containing a mixture of Christian dogma and exhortations to the Christian life is another. We have also seen tha the Cento had the same origin, the word deriving from the Greek kentones meaning point and thus needle, therefore needlework and then quilt or patchwork. Weaving was probably the earliest type of decorative art or craft in primitive Greek societies and indeed in all early societies and is of extraordinarily ancient origin. Although the textiles themselves have not survived from ancient times, evidence of them has, in at least four different ways: impressions of ancient cloth preserved in clay, the physical remains of looms and spindles which date back nearly 10,000 years, depictions of clothing on both pottery and sculpture and, finally, literary references to spinning and weaving. There are numerous occasions when metaphors from the art are used in classical literature. Plato employs the metaphor of the spindle of the universe in the Republic (616c) and refers at length to the weaver king in the Statesman (305e-). Similarly ubiquitous was the metaphor of spun threads or cords to illustrate the Greek obsession with moira or the fate which binds men to their destiny. Even now we use phrases such as 'we are bound to do our duty', an example of the extraordinary resilience of traditional phraseology over the millennia. Images of a sacred skirt go far back into prehistory. We can note that some of the Venus figurines from Paleolithic times, that is from at least 20,000 years ago, wear girdles or belts and at least one has a incised loin cloth in which the weft and warp and knots of the weaving are accurately depicted. Belts are believed to be the earliest form of weaving since they could be made on a simple narrow hand loom and it is not a coincidence that the earliest Greek word for a piece of clothing was zone or belt. There is evidence that these belts or loin clothes were used not as one might expect to cover the sexual parts of the ancient goddesses depicted in the Venus figures but to emphasise them, thus recognizing and honoring the role played by the female in the propagation and perpetuation of the species. There is an amusing episode in the Iliad (14, 180) where Hera, the wife of Zeus, puts on a tasseled belt over her nakedness in order to win her husband over to her side in the Trojan conflict and then, to make sure of the matter, puts on a second one under her breasts. Needless to say, at the sight of her, Zeus is beside himself and she wins the day. And we can find even more persuasive evidence of the importance of weaving in Greek religious and mythical tradition. As Xenophanes (570 -489 BCE) tells us in the famous passage: 'Man creates God in his own particular image. The Ethiopians say that their Gods are snub-nosed and black-skinned and the Thracians that theirs are blue-eyed and red-haired. If only oxen and horses had hands and wanted to draw with their hands or to make the works of art that men make, then horses would draw the figures of their Gods like horses, and oxen like oxen, and would make their bodies on the model of their own,' and similarly, we can find multiple references that the Greeks envisioned heaven itself and creation as a great weaving. It is not surprising that with such an ancient and central tradition to society and culture, metaphors and symbols of weaving were popular, long-lasting and ubiquitous. And as for books, we need only remember, to emphasize the point, that papyrus was made out of woven reeds and that text and textile have the same root. Continuing a review of the titles of occasional pieces, this entry is on the forest, silva in Latin or hyle in Greek. Why occasional pieces? Because short pieces, one-liners, sound-bites were the hall-mark of much of the symbolic literature and it is instructive to examine their origin. A starting place is Aulus Gellius ( 2nd century CE). In the Introduction to his Attic Nights, he accounts and apologizes for his title, citing some thirty other words for collections of anecdotes, poems or stories by his contemporaries or predecessors. Amongst these thirty is Silva together with other pastoral words (meadows, flower gardens) and indeed the Peplos which we have discussed before. It is interesting that both Silva as wood, material, and Peplos as something woven, figure amongst the most primitive necessities for an early society and thus not unexpectedly are amongst the earliest words to develop a metaphorical meaning. Hyle is first used by Aristotle to describe material and hylomorphic represents his concept that existence requires both material and form. Silva, the Latin synonym of hyle shows a similar semantic progression from forest, to the material wood, to any type of material, to subject matter. As a digression, we can note that Plato in the Timaeus avoids the use of the word hyle in his description of what the universe was made from. He says (47e) that the world came into existence through a combination of intelligence and necessity, the intelligence (or providence, fate) being that of the creator, the Demiurge. The question is what is 'necessity', his word, ananke? Plato actually avoids an answer to the question but goes on immediately to discuss the four elements fire, water, earth and air. Calcidius (early 4thC CE) in his commentary on the Timaeus, which was the only work on or by Plato available in the Middle Ages, says (268) that by necessity is meant hyle using the self-serving logic that material was necessary for anything to exist. But this conclusion colored later belief that the unfolding of the universe was determined i.e. necessary, although Plato in the same breath (48a) actually introduces the indeterminate or random cause as a factor in creation. As another digression, it is possible that there may be an etymological connection between Hyle and Troy. It may be that Hyle at one stage was pronounced without the breathing, i. e. as Ili and this may be the origin of Ilion (See Robert Lamberton's Homer's Ancient Readers Princeton 1992 p132) It is suggested that the Iliad was an allegory of the struggle of the soul to conquer the material earthly prison of its body while the Odyssey was a similar allegory where, by contrast, the sea represents materiality. Thus, it is only when Odysseus finally plants his oar in a place where no one recognizes what it is (i. e. well away from the sea) that his soul is finally free. The sea as materiality or a representation of silva was apparently commonly recognized and is specifically stated as such in Pophryry's Cave of the Nymphs (17). Indeed the sea as a tempestuous and chaotic medium is a good representation of Plato's belief that the universe was created out of chaos, silva, rather than the Aristotelian from silva/hyle. Returning to literature, we can detect the semantic progression clearly in the Silvae of Statius (1stC CE), one of the first works with such a title, which was both a series of short pieces and, as he himself points out, only raw material or rough drafts of what he presumably intended to polish up later, although this may have been a literary subterfuge to emphasize his artistry since he also explains he took no longer than two days to complete any one of the poems. If this was his aim, he succeeded, since Dante, rather surprisingly, calls him one of the greatest classical poets of all, second only to Virgil himself. We know of two other classical authors who wrote or made collections of short pieces, Silvae or Hyle, Valerius Probus (late 1stC CE) and Ateius Philologus, (1st C BCE) the latter going over the top and apparently writing 800 books of them. Quintilian (1stC CE) in his Institutio Oratoria, the classic work on Rhetoric, describes the Silva as a rough draft (10, 3, 17). The two shades of meaning of Silva carried right through to medieval times and later. In both Mansion's edition of the Ovide Moralize and Mielot's translation of the Speculum Humanae, the authors employ the same parable to justify the practice of relying on these short extracts. They both describe how a group of workers fells a large tree and each one of them takes from it different pieces to suit his own purpose, one to build his house and another his boat. Ben Jonson also exhibits both uses of the word. In the preface to his Under-Wood he says, 'the Ancients called that kind of body, Sylva or Hyle, in which there were works of divers nature, and matter congested.' In his Timber, he points out that 'Silva, [is] the raw material of facts and thoughts, hyle, timber as it were.' (see D. H. Radcliffe, Sylvan States p799). By the late Renaissance, Silvae were appearing thick and fast. There were works by Poliziano, Sanzaro, Barclay, Buchanan, Cowley, Fletcher and Dryden which contain collections of poetry. In another blog, I shall deal with another aspect of the Renaissance forest, its literary significance as a dark and dangerous place, symbolic of the subconscious, as it appears in works such as the Commedia and the Hypnerotomachia Polifili. One theory as to the origin of the Peplos of Aristotle revolves around its connection with the Pananthenaic peplos. This idea is directly alluded to in the introduction to the 1798 edition of the Peplos with which I started the first entry of the Peplos blog. Here the commentator says that 'the peplos was the sail on the Panathenaic ship on which was depicted the killing of Enceladus by Minerva (Athena) and those strong men who were worthy in war for the fatherland.' For his authority, he quotes a passage from the Knights of Aristophanes which essentially repeats the phrase I have given above. This interpretation of the passage is repeated as authoritative by later commentators including, for instance, Th. Preger in his article Zum Aristotelisches Peplos in the Abhandlungen aus dem Gebiet, Munich 1891, although it will be noted that Aristophanes says nothing about Troy, about epitaphs or about Aristotle. The Pananthenaic peplos was the cloth or dress which was carried in procession at the festival and offered to the statue of the goddess, Athena, within the Parthenon. It is possible that there were two peploi, one a small one used in the annual festival and the second one a large one which was used in the four yearly great festival and was large enough to serve as the sail of a ship, which was wheeled through the streets, before being presented to Athena. For those who are interested in further details, I recommend Mansfield's dissertation on the subject, The Robe of Athena and the Pananthenaic Peplos (UCL, Berkeley,1985). It is clear from this that the ceremony did not originate in Athens and was not confined to that city; Mansfield identifies 34 other locations where there were ceremonies presenting garments to statues of gods and 15 where there is some evidence of the practise. Even in the Iliad, when things are looking bleak for the Trojans, the women present their statue of Athena with a new peplos, so it was clearly an ancient custom. Theories as to the purpose of this ceremony and the origin of the peplos as a sacred object will be given in another edition of this peplos thread. For instance, it is supposed that the tradition of the sail hanging on the mast of the wheeled ship was derived from the ancient ceremony of covering a sacred tree with a cloth. But more of that another time. When and what was the origin of the Panathenaic procession. According to Apollodorus (Library 3.14.6) the Pananthenaia was started by Ericthonios the founder of Athens or, according to Pausanias, by Cecrops, Ericthonios' son. This would have been about 1550 BCE. When was the ceremony of the peplos introduced: possibly during the late 6th century during which Athens defeated Boeotia where the rite of the peplos may have originated and certainly no later than the middle of the 5th century BCE when the Parthenon was built since the procession of the peplos is depicted on the frieze of the Parthenon. Some say that the ceremony of the peplos began after the victories of the Persian war and if this were the case it would make sense if heroes were depicted on the peplos although they would not have been Trojan heroes. Plato says (Euthyphro) that the peplos showed the gigantomachy or struggles of the gods and Aristophanes in the Birds says it shows the gods 'withering the sons of the Earth.' The meaning of the Knights passage of Aristophanes referred to above is actually ambiguous. Mansfield and later commentators say that it refers 'Athena's deeds of prowess' and not to great men or heroes. There is a third possible interpretation: something like, 'the peplos is worthy of Attica and the Knight's place in its great religious festival'. Again nothing to do with the heroes of Troy. Another relevant reference is in Aristotle's Athenian Constitution (49.3) which says 'At one time the Council used also to judge the patterns for the Robe, but now this Council was thought to show favoritism in its decision.' (trans. H. Rackham). This extracts implies several things: that the pattern was different each year, that there was a competition for the winning design of any one year and that this competition was eventually abandoned and thus presumably the design became fixed. The competition could however have been for only a part of the Peplos, perhaps a decorative border, but not the main subject matter showing Athena and her defeat of the giants. There is no evidence here for or against the possibility that, in one year or several, the Peplos could have depicted as its main or subsidiary subject the heroes of the Trojan war. There is another reference to the Pananthenaic Peplos in Plutarch's essay Life of Demetrius, the possibly fictional character who conquered Athens and is said to have required that his image be woven on the peplos besides that of Athena and Jupiter. This demand so enraged the gods that during the procession the peplos was said to have torn in two in the wind. But again there is no mention here of heroes or giants. Demetrius lived in theory about 300 BCE. It appears that we have to accept that there is no evidence for a direct link between the Pananthenaic peplos and the Peplos of Aristotle. We shall have to look elsewhere. The Hypnerotomachia Poliphili published by Aldus in 1499 is that wonderful fantasy which has been called by Carl Jung, for instance, in his introduction to Linda Fierz-David's The Dream of Poliphilo (Spring Publications 1987) 'among the most beautiful printed books of all time.' I call the book wonderful because it remains a treasure trove of mystery not the least as to the identities of both author and illustrator and much else besides. Here I shall be content to discuss the inspiration for those hieroglyphic messages inscribed on the monuments which Poliphilo discovers and admires during his quest for the consummation of his love for Polia. There are several separate possibilities or combinations of the same for the origin of the hieroglyphs of the Poliphili: the Hieroglyphica of Horapollo, the frieze from San Lorenzo fuori le muri, the frescoes in San Giustina in Padua and/or the pictures in a house in the vicinity of the Palazzo Orsini at Monte Giordano. The Poliphili (for short), which is anonymous, is usually assumed to have been written by Francesco Colonna, a Venetian monk. Why? Because his name is found in a secret message, discovered soon after the book was published, made up of the first letters of all the chapters in the book. However this seemingly definitive identification has not given pause to the academic scribblers who have proposed, to my knowledge, at least ten other possible candidates for authorship. It was originally believed that the book was written in or before 1467 but it is now known that there must have been, at the very least, revisions right up to the date of publication in 1499 since reference is made in the book to a manuscript which Aldus says at the time was 'recently discovered'. It is now assumed that Book II of the Poliphili which contains a rather flaccid summary of the story was perhaps an early or juvenile outline of the plot, begun as early as 1467, while the main story, Book I, was written in the following decades up to the moment of publication. So, back to the origins of the hieroglyphic script in the Poliphili., of w hich there are some five long messages and several other individual pictures. First the Hieroglyphica of Horapollo. This famous manuscript aroused enormous enthusiasm in contemporary humanists who perceived that here, at last, was evidence of that primal script which united in one the two elements of the symbol, both signifier and signified, and gave direct access to an understanding of the divine realities. Although the manuscript was discovered as early as 1419 in Greece and immediately taken to Florence, it was not printed until 1505 (by Aldus) and not translated into Latin until 1515. So can Colonna have read the original manuscript or any of the copies? Let it first be said that according to Giehlow (Die Hieroglyphen-kunde des Humanismus in der Allegorie des Renaissance page 24 note) only four manuscripts of the book from the 15th century have been identified (this excludes the famous Pirckheimer ms from the early 16th century partly illustrated by Durer). It is also the case that none of these four early mss were illustrated and the first printed illustrated edition was from Kerver in 1543 where many of the illustrations were copies of the Durer illustrations just mentioned. None of the these illustrations and indeed none of the descriptions bears anything like the meaning attributed by Colonna to the individual elements of his hieroglyphic messages. The next possibility is the frieze from the church of San Lorenzo fuori le muri at Rome. The pulpit in this church was, in the 15th century, decorated with an ancient Roman frieze which had hieroglyphic pictures carved on it. The frieze was well-known at the time, a tourist attraction, and was subsequently moved into the Capitoline Museum where it still is. It is believed that the frieze originally came from a Roman temple - an otherwise unknown temple of Neptune because of the number of naval motifs in the frieze. However, as Iversen points out (The Burlington Magazine, Vol 100, #658, Jan 1958 p 19), there is a fragment of a similar frieze still in place in the extant Temple of Vespasian so it would make sense that the Capitoline frieze also came from there although a description of the former says it is just over a meter high whereas Giehlow gives the height of the latter as .59 m high. 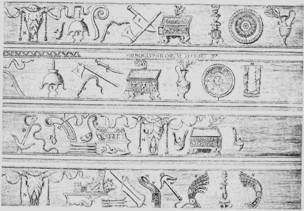 I have not seen the original Capitoline frieze but there are pictures of parts of it in several publications namely Giehlow (cited above) pp 56, 59, Ludwig Volkmann's Bilderschriften der Renaissance (Leipzig 1923) p 16, Erik Iversen's The Myth of Egypt and Its Hieroglyphs in European Tradition (Princeton 1993) and Rudolf Wittkower's Allegory and the Migration of Symbols (Thames & Hudson 1997) p 119. The last two are copied from Herwath von Hohenburg's Thesaurus Hieroglyphicorum of c 1607 one of many contemporary copies of the frieze. The next possibility is referred to in Giehlow as the pictures in a house near the Palazzo Orsini in Monte Giordano. They are described in Geoffrey Tory's Champ Fleury of 1526, his masterpiece on the proportion of letters which led to him being appointed Royal Printer to the French king. He says (p 183) that here there is painted ' an ox's head with two horns and a hoe hanging from each horn, and above it an eye; and next that a kettle full of fire, a man's face, a vessel from which water is flowing, violets in a jar, an eye over a shoe, a ship's anchor, a crane holding a stone with one of her feet and a dolphin on a lamp which is held by a hand.' This translation is by George B. Ives from the Grolier Club edition of 1927 although Ives mistranslates 'a hoe hanging from a horn' as 'a frog hanging from each horn'. Tory could have seen this picture, according to Giehlow, during a visit to Rome in 1512. Be that as it may, this is a much more accurate depiction of what is on Poliphili picture above than what is on the frieze. But who knows, the picture may have been painted from the book rather than vice versa. Incidentally, the sloping pitcher ('a vessel from which water is flowing') is almost identical to the pitcher on the Temple of Vespasian rather than from any on the Capitoline frieze. The next possibility are the frescoes in a hall in the convent of San Giustina in Padua. The frescoes have now largely been destroyed but they were copied by Francesco Mengardi in a beautiful series of engravings made at the end of the 18th century. It is quite obvious that some of the motifs in the frescoes are copied from Colonna or was it vice versa? The frescoes were started by Bernardo Parentino but remained unfinished at his death in 1540 and were finished later by Girolamo del Santo. We do not know when Parentino began his work but it could conceivably have been much earlier. Ludwig Volkmann in his book (cited above) quotes (p23) Léon Dorez, a 19th century French philologist, as being of the opinion that Colonna copied the frescoes and not vice versa though he provides no evidence to support this. We can note also that there were references to the hieroglyphs in classical writers who give translations of a few of the symbols that have been reported to them e.g. Herodotus,l Diodorus Siculus, Pliny, Plutarch, Clement of Alexandria and others. It is no doubt possible that Colonna had read some of these authors. Not only were mirrors an ubiquitous choice of title but they were also frequently employed instruments at critical moments in many literary works of the age. For the former, we can think of Vincent of Beauvais' Speculum Majus, the Great Mirror, from the 13th century, the most comprehensive of the medieval encyclopedias which had some 9,885 chapters (excluding the 4th book now known to be written by a later author) and covered most of the knowledge of the time. There was the Speculum Humanae Salvationis, Mirror of Human Salvation from the early 14th century. Each page of the book illustrates a scene from the New Testament and its type or prefiguration in the Old Testament. This was so popular that it was translated into many vernacular European languages and over 300 manuscript copies survive as well as many printed editions. The Speculum Stultorum, Mirror of Fools from the 12th century by Nigel Whitacre was the first of a long line of medieval and Renaissance texts on foolishness, which climaxed with Brant's famous Ship of Fools. A fool at the time was more than just stupid; there was always, in the meaning of the word, the undertone that he was a sinner, a Christian back-slider. There were many, many others: the Speculum Astronomiae, the Mirror of Astronomy, from the 13th century was actually a handbook of astrology, Caxton's Mirrour of the World, a compilation of contemporary information on earthquakes and volcanoes, The Mirrour for Magistrates, published in 1559, the story of some of the more unfortunate characters of English history and the Duodecim Specula, subtitled, Twelve Mirrors with which to see God, an emblem book by Jan David of 1610. 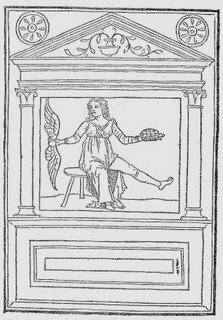 As for mirrors within literature, there was the threefold mirror in the Anticlaudianus by Alain de Lille, the mirror of Narcissus in the Roman de la Rose, Leah's mirror in the Commedia and mirrors play an important role in the Pelerinage de la vie humaine by Deguileville and Langland's Piers Plowman. So what is all this about? What is the common thread to these ubiquitous mirrors? The Christian tradition goes back to the beginning, to St. Augustine and to the Bible. There is the famous passage in I Corinthians 13,12 which, in the King James version, is translated as 'we now see through a glass darkly' which, actually, does not do justice to either of the two key words ' a glass' which in the Vulgate is 'speculum' and darkly is 'in enigmate'. Thus a more meaningful translation would be 'we now see ourselves in a mirror as an enigma'. Those who wish to take this passage further can refer to St. Augustine's brilliant exposition of it in his De Trinitate XV. Augustine was actually into mirrors and much of the Christian tradition on the subject goes back to his Speculum de Scriptura Sacra, a compilation of passages from the Bible, another work entitled just Speculum which was a rule book for monastic life later adapted by St. Benedict and the Speculum Peccatoris, the Mirror of Sin, which may not be authentic. The mirror was thus akin to the dream and the vision. It was, first, an instrument of self-reflection. Socrates advised that everyman should look at himself in the mirror every morning and consider his nature and his opportunities. But the mirror meant more than self-examination and this was the paradox. Not only can you see yourself in the mirror but you can see the world beyond yourself through the glass. The mirror as a vision of self can be be false. As the Ovide Moralise puts it 'let him understand by Narcisus those who delight madly, senselessly, the haughty, the presumptuous, who misuse temporal goods, who see themselves and take delight in the false mirrors of the world' (quoted from Steven Kruger's Dreaming in the Middle Ages Cambridge 1992). But if it is not abused, the mirror can lead on to greater knowledge, knowledge of this world as in the Speculum Majus and, thereafter, knowledge of God himself.